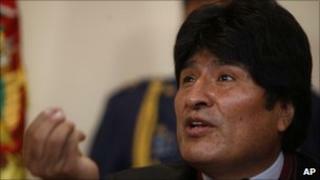 Image caption President Morales was the alleged target of European "mercenaries"
Bolivian prosecutors have charged 39 people over an alleged plot to assassinate President Evo Morales and launch an armed rebellion last year. They include opposition politicians and a former general who captured the guerrilla leader Che Guevara in 1967. The alleged plot was uncovered in April 2009, when Bolivan police killed three suspected European mercenaries in the eastern city of Santa Cruz. The accused have denied the charges, calling them politically motivated. Most are already under arrest, but 17 are now living outside Bolivia. The most prominent politician charged is Branco Marinkovic, a business leader and former head of the opposition Civic Committee of Santa Cruz, who is in exile in the US. Among the former senior military officers charged is the retired General Gary Prado, who led the unit that captured and killed the Argentine-born guerrilla leader Ernesto "Che" Guevara. All are accused of being involved in a conspiracy to kill President Morales and form militia groups with the aim of either overthrowing the government or declaring independence for Santa Cruz. Prosecutors say they have email evidence linking them to three European mercenaries killed by police in Santa Cruz in April 2009. Two other Europeans were captured in the police raid, and arms and ammunition seized. The shot men included Michael Dwyer, an Irish citizen, and Eduardo Rozsa-Flores, a man with joint Bolivian, Hungarian and Croatian nationality. Mr Rozsa-Flores, a veteran of the Balkan wars in the 1990s, is alleged to have been the ringleader of the plot. In a video interview which emerged in Hungary after his death Mr Rozsa-Flores said he had been called to Bolivia to form a militia to protect Santa Cruz and was prepared to declare independence for the province. Santa Cruz in Bolivia's eastern lowlands is a stronghold of opposition to President Morales, whose main support is among the indigenous communities of the western highlands. In 2008-9 there were frequent demonstrations in the province against Mr Morales's left-wing policies and in favour of greater autonomy, led by regional politicians and business leaders. Branco Marinkovic and other opposition figures have denied any link to Mr Rozsa-Flores and accused the government of creating the case against them for political reasons. "I am persecuted by the Bolivian government and forced to live outside my beloved Bolivia because in my country my life is in danger. There are no guarantees I would get a fair trial," Mr Marinkovic said from exile in the US. Bolivian Vice-President Alvaro Garcia Linera said on Saturday that Mr Marinkovic should come back to Bolivia to "defend his truth", and suggested his leaving the country amounted to a confession of guilt. The alleged plot was "the most serious act of conspiracy against the unity of the country," the vice-president said. Former Gen Prado also denied any involvement when he was called to testify before prosecutors earlier this year. "It seems laughable that a general with my career history would put himself under the orders of a mercenary," he said. President Morales is an outspoken admirer of Che Guevara, who was trying to start a revolution in Bolivia when he was captured and killed by Gen Prado's troops.